Not very long ago, it was fashionable to ask if millennials would ever crawl out of their parents’ basements and into a realtor’s office. Enthusiasm for that view, which had gained wide exposure by 2012, lost steam as mortgages got easier to come by and millennials kept insisting that no, actually, they do want to own a home. A flurry of reports released yesterday should further dispel the notion that millennials are allergic to homeownership. Half of U.S. homebuyers are under 36, Zillow reports, based on a survey of 13,000 respondents, and first-time buyers account for 47 percent of purchases. 1 First-timers make up 52 percent of prospective buyers planning home purchases in 2017, according to the results of another survey, published today by Realtor.com. When the company conducted the same survey last year, it found that only 33 percent of prospective buyers were first-timers. Millennials, it seems, are poised to take a bigger share of the U.S. housing market. This is mostly a matter of basic math and common sense. First-timers have always made up a large share of home purchases, and their median age has hovered around 33. 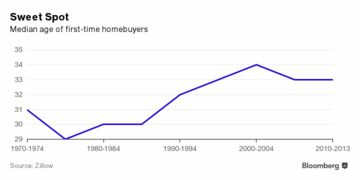 Back in the days when serious people were afraid that young people, burdened with student debt and enamored of city living, had quit on homeownership, the oldest millennials simply hadn’t yet reached the age at which most Americans have historically bought their first homes. Now, millennials are aging into the prime years for first-time homebuying, and evidence is mounting that they’re becoming the dominant force in the U.S. housing market. Last month, the Urban Institute pointed out that mortgages to first-time homebuyers had recovered to 2001 levels, while repeat purchasers continue to do home renovations or wallow in the post-housing-crisis doldrums. (That analysis excludes cash buyers and includes boomerang buyers—foreclosure victims reentering the market—as first-timers.) Meanwhile, the credit bureau TransUnion reports that 60 percent of first-time homebuyers in the fourth quarter of 2015 were between the ages of 20 and 39. So why did anyone believe young people were done with homeownership? In the years following the global financial crisis, which began with easy credit, it was hard to qualify for mortgages. Millennials carry more student debt than older Americans, though it’s hard to say how much that keeps them from buying a home. American households are likelier to be found in rental housing than at any time in the past 50 years, and the trend away from homeownership has shown up among the young. But millennials, despite all you read about what they like and hate and will buy and won’t buy, are people, and people in America have a long history of favoring the benefits conferred by homeownership—stability, price appreciation, and tax credits among them. Their biggest roadblock to homeownership may not be personal preference or personal finance. According to a recent analysis by Fannie Mae economists, a bigger obstacle is single-family landlords, who have snapped up a massive slug of starter homes in recent years, turning millennial homebuyers’ likely targets into rental properties. That may explain another finding from the Zillow survey: As a group, millennials have skipped past traditional starter homes, buying first homes that are about as large and as expensive as the homes purchased by members of older generations. Millennials showed up in the housing market later than some people expected. Now they’re making up for lost time.